1. Ahenny. North Cross. East Face. Base Detail. Close up. 2.46m high 1.37 across arms. Shaft tapers 49 cm wide and 36 cm thick at end. It rests on a stepped base. It is topped by a stone which is the subject of debate. There are queries as to whether this unusually shaped stone belongs to the cross at all. Porter (1931, p.22) has suggested a bishop's mitre. Richardson has suggested an association with the Church of the Holy Sepulchre in Jerusalem, (Richardson, 1984, p.130). 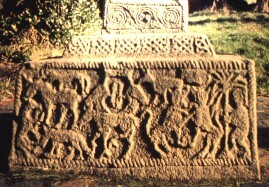 Detailed Description of Base of North Cross East Face: God creates the birds and the beasts OR Adam names the animals. The representation of a scene from the Old Testament, Book of Genesis. East Face: God creates the birds and the beasts OR Adam names the animals. A representation of a scene from the Old Testament, Genesis.